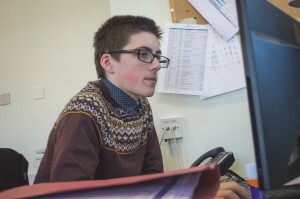 Matthew Read, age 15, is a pupil at the Studio School in East Cowes. As part of his education he spends one day a week doing valuable work experience at UKSA, working in the Sales and Marketing Department, which is a busy office of around 12 members of staff. My work placement at UKSA has been fun – working in an office can also be a little boring but nine times of out ten it’s fun. My first week I had a health and safety session and a tour round UKSA and my department (Sales and Marketing). I got to know everyone’s name around there and got my own desk and computer. I had to do a bit of excel work which was comparing prices for different leisure courses and I also had to count how many boats there were for a trivia facebook post – I found there are 203 boats/watercraft here. In my second week I still was working on my leisure courses task but I was also doing press cuttings, sorting them out and putting them in to a binding folder whilst putting the dates and which newspaper it came from. On December 12th we had a Christmas lunch out and we did Secret Santa with everyone in the office. I enjoyed every single bit of it. The food at the Christmas Lunch was really tasty (and it is at UKSA too), and like I said I enjoyed every single bit of it. After Christmas Holidays: Coming back on my first day here in the first part of the day I had to finish the press cuttings binder and then got shown how to use Salesforce. I have been filling that in, from forms people have completed when taking part in UKSA activities. This work placement is different to school because I feel like I’m being treated like an adult and I have lots of work to do and I will miss it when I leave.